Corey & Stacy Johnson laden zum Verweilen ein und erleben Sie dieses 2 Schlafzimmer Hütte mit einem schönen Blick auf den Lake Michigan! Es hat auch genügend Privatsphäre für einen großen Familienausflug oder Optionen für mehrere Ferienhäuser mit einer größeren Gruppe zu mieten. Die Haustür ist 100 Meter entfernt von der Klippe und dann nur 40 Stufen hinunter zu einem privaten Strand! Sunset Beach Cottages ist eine ruhige und private Lake Michigan Einstellung mit einem atemberaubenden Blick auf den Lake Michigan und einem unberührten Sandstrand. Wir sind bequem in der Muskegon Gegend, aber am unteren Rand der Klippe mit Meilen von Strand in einer privaten Umgebung versteckt. Unsere 6, 1-4 Schlafzimmern auf dem Land nahe genug zusammen in Gruppen für Familientreffen und andere Arten von Zusammenkünfte, aber weit genug auseinander, um Ihre eigene Privatsphäre zu schaffen, gemietet werden. Die Einstellung ist ideal für Familienfeiern sowie Ihren eigenen privaten Wochenende Urlaub. Es gibt viel Platz, sowohl in den Hütten und auf den gut Gras bedeckt Gelände gehalten. Unser Privatstrand verfügt über einige der schönsten Strand Sand in der Welt, sowie die beruhigenden Klängen der Wellen an der Küste Läppen für einen angenehmen und erholsamen Zeit. The hosts were very accommodating before, during and after. The cottage was in great shape and more than met my needs. Being so close to Lake Michigan is a rare find. Cottages are surrounded by lush grass so there’s no tracking sand into cottages. Very pleasant experience and planning a multi-family visit next year! A great little cottage with easy access to an awesome Lake Michigan beach! The Sunset Beach Cottages are a peaceful and family friendly place to enjoy Lake Michigan. Access to grocery stores and other amenities is just a short drive away, but the setting for the cottages makes you feel like you're far off the beaten path. The beach felt like a private space just for us, even over 4th of July week there were only a few times that things got even close to crowded. I highly recommend this rental! Nice cabins with easy access to the lake. Very relaxing. Beautiful, Clean & Comfortable! Nothing Too Fancy = PERFECT. Thanks Corey and Stacy, We'll Be Back! Had a lovely time at the property! The view of the lake and the beach itself were both breathtakingly beautiful and SO close to the cottage. The beach is larger in real life than in the picture online, but that might change on the season and how much rain they get. We stayed in #4 (Beach) which had 2 bedrooms, 1 bathroom, and an adjoined kitchen with a small dining table/2 chairs, and living room with 1 big couch and 1 love seat. There was also a grill/picnic table with 2 chairs out in the front, which we did not use, but appreciated! We had 3 in our party and stayed for 2 nights the 1st weekend of June '18 to do some winery tours/tastings in the area. Was the perfect size for us! It actually could have slept more, probably 5 or 6 (2 in the bunkbed room, 2 in the queen room, and 2 on the couches in the living room), depends on how you prefer your sleeping arrangements though. - The bunkbed, in our opinion, was more of a bunkbed for kids, so we didn't use the top. We instead set up an air mattress we brought on the floor for one of us next to the bunkbed. So one slept in the full bottom bunk and one slept on a TWIN air mattress (beware, that's all that'll fit in there!) beside them on the floor. About the bunkbed - It felt pretty rickety to us, being grown women, especially because the ladder was so small... actually a part of the ladder was broken, but beyond that, we didn't use it mainly because it made a lot of sound when we rolled over or got on/off so we decided we'd get better sleep the way we did it. **It's probably PERFECT for kids though!! So keep that in mind! - Although there were NO mosquitos (TOTAL SHOCKER!) or really any other bugs except for two very large, but friendly beetles, bring your own bug spray. - Things that ARE included: Wine opener, Bath/Welcome rugs, TV, Wifi, Pillows (not the best), Light blankets (pretty thin), Games, SOME dishes and cooking utensils (bring extra just in case, including cups/glassware! ), 1 box fan, 1 oscillating fan, Fridge/Freezer, Microwave, Toaster and Cleaning supplies. We stayed in cabin #4 for five nights, starting over Memorial Day weekend. This is a very simple, rustic, quaint cabin that had everything we needed in a great location right on Lake Michigan. It was just what we were looking for. Since we were there before the summer high season started, we were only people there for three of our five nights which was nice, but even with others there, everyone had their own space and the beach was large enough for everyone. There are posted "quiet hours" from 10pm-9am which was good to see and although everyone staying there was pretty quiet anyway, people respected them. Corey, the owner, was also very nice and accommodating and (since they were empty) allowed us to walk through the other three cabins. While cabin 4 was fine for our needs, the other cabins seemed to be a little more updated. I believe two had showers with bathtubs (cabin 4 has a very small shower only) and one had a washer and dryer which would be really nice for longer stays, especially for families. As others have noted, there is no air conditioning and although it was cool at night while we were there, it was difficult to catch a cross breeze in the bedrooms. We brought a fan, which helped move some air so I'd definitely recommend packing a fan or two. 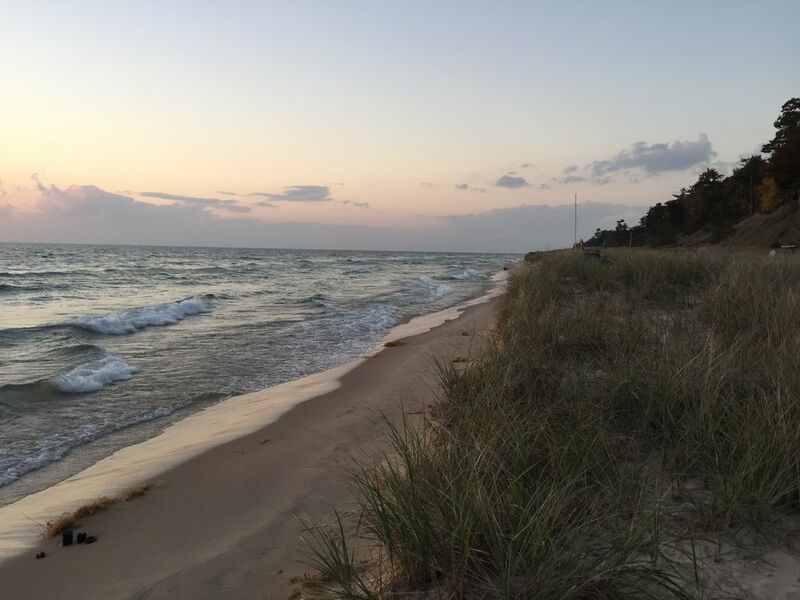 The location of Sunset Beach Cottages is perfect - right on Lake Michigan with a beautiful beach, very close to Muskegon State Park and a quick drive into Muskegon for supplies or ice cream (go to Norm's Ice Cream for a cone, but order the small!). There is a lot to do in the area. Muskegon has a nice walking and biking trail system. We rented bikes at City Hub Cyclery in Muskegon (very nice folks!) on one of our afternoons there and rode 13 miles (round trip) from there to Lake Michigan. We also made a day trip to Sleeping Bear Dunes (2.5 hours north) and had lunch in the lovely Glen Arbor. On our other days we hung out and read in Adirondack chairs, walked the beach and just relaxed! I'd highly recommend Sunset Beach Cottages. It is a perfect place for young, old, or multiple families to vacation together but still have their own space. We plan to go back! NOTE: Linens and Towels are NOT provided. The Cleaning fee of $100 is REFUNDABLE if the cottage is cleaned prior to departure (cleaning supplies are provided). We look forward to your visit!